With the toppling of the Egyptian president Mohamed Morsi, it seems that Washington and Damascus, polar opposites in the political arena, might have found some common ground. The leader of the Egyptian Muslim Brotherhood, Mohamed Morsi, is no longer president of Egypt, the U.S. Department of State announced on Wednesday, July 10, effectively putting an end to the dialogue with political Islam. In turn, Syrian President Bashar Assad was one of the first to welcome the overthrow of his Egyptian counterpart. It seems that Washington and Damascus, polar opposites in the political arena, have found common ground. How has this happened? The changing of the monarchy in Qatar, the anti-government protests in Turkey and, finally, the military coup in Egypt — all of these events are part of the same chain. People in the Middle East have started to turn against “political Islam,” which is represented in the form of the Muslim Brotherhood. In early June, the emir of Qatar, Sheikh Hamad bin Khalifa Al Thani, abdicated and handed over power to his son. Declining health had forced the leader to withdraw from politics, although he had always reigned rather than ruled. At the helm was the prime minister and minister of state for foreign affairs, Hamad bin Jassim, who can rightfully be credited with turning Qatar into perhaps the most important player in the region. Under Jassim’s leadership, Qatar was actively engaged in the struggle against Libyan leader Col. Gaddafi, supported the Muslim Brotherhood in Egypt financially, and helped supply combat troops in Syria with weapons, says Vyacheslav Matuzov, head of the Russian Friendship Society with Arab Countries. The new emir of Qatar, Sheikh Tamim bin Hamad Al Thani, has already appointed a new prime minister, as well as a new minister of state for foreign affairs, Khalid bin Mohamed Al-Attiyah, who is a family member on his mother’s side. Matuzov believes that these shifts in the government promise to lead to a more balanced course for Qatar in the region. The situation in Turkey is somewhat different, although the results have been very similar. Here, Prime Minister Recep Erdogan faced protests against the turn away from the country’s secular development that was laid out by Mustafa Ataturk when the Republic of Turkey was established. Hot Turkish Summer: Is the Arab Spring spreading? The protests, which arose as a reaction against the urban development plan for Taksim Square in Istanbul and eventually led to demands for the prime minister’s resignation, were stopped amid criticism in Washington about the extreme measures being taken by police. “The demonstrations were directed against Erdogan’s regime. It is known that 60 percent of Turkish people do not support the government’s anti-Syrian line. That, coupled with internal unrest, affects Erdogan’s political stability,” says Stanislav Tarasov, an expert at the International Institute of the Newest States. The big question is this: How will Ankara’s support of the Muslim Brotherhood look after this? 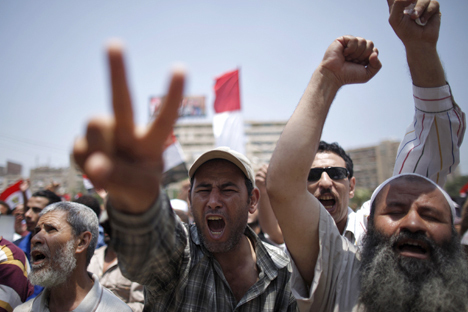 In Egypt, political Islam, with the Muslim Brotherhood as its face, is suffering a crushing defeat. The organization, established in the late 1920s by the British intelligence services to combat communist influence in areas of concern in the Middle East, had a large following outside the capital. Eighteen months ago, the Muslim Brotherhood was able to take advantage of the destabilization caused to President Mubarak’s regime by the uprising of the urban population — which it then mobilized to secure a marginal victory in the presidential elections. It took just one year for Morsi and his supporters — who had absolutely no experience running a country, yet actively pushed Islam into the political sphere — to turn their allies into opponents. It seems that it did not take much for them to take to Tahrir Square in protest. After this, the army restored the status quo that had reigned 1.5 years previously, once again sending the Muslim Brotherhood into isolation and repealing the constitution that the Brotherhood had installed. The first countries to voice their support for the revolution were Saudi Arabia, the United Arab Emirates and Kuwait, agreeing that a country’s constitution should have nothing to do with the Koran. As a matter of fact, King Abdullah of Saudi Arabia said in an interview this spring that Morsi’s Muslim Brotherhood was nothing more than a “wolf in sheep’s clothing.” To put their money where their mouths are, the same three countries sent a $10-billion emergency aid package to Egypt just a few days ago. Washington is refusing to make any unequivocal assessments of the events in Egypt, although President Obama has re-opened discussions about providing assistance to the country — assistance to the tune of $1.5 billion. According to Psaki, the U.S. Department of State does not see the events in Egypt as a revolution. “What I mean is what we’ve been referencing about the 22 million people, who have been out there voicing their views and making clear that democracy is not just about simply winning the vote at the ballot box,” she said. This is a sentence — a sentence that even the president of Syria is prepared to sign off on. “What we have seen on Egypt is the collapse of what has been called political Islam. Those who use religion for political purposes or in the interests of a specific group will be overthrown, no matter where it takes place,” Assad said. Here the question of the Unites States’ attitude toward Assad — who for more than two years has been fighting both the opposition and Islamic fundamentalists in the form of armed Salafi militants, Al Qaeda and the Muslim Brotherhood — arises. How can we reconcile the United States’ refusal to enter into a dialogue with the followers of political Islam in Egypt with their support of the same group in Syria? The answer can probably be found in the decision of the U.S. Congress to block military aid to the Syrian rebels; or, perhaps it has something to do with the national opposition’s call for a ceasefire during Ramadan celebrations; or the long-awaited U.N. decision to accept the Syrian government’s offer to enter into negotiations about the accusations from both sides in the conflict that the other has been using chemical weapons. It is in this very context that we can assess the prospects for an international conference on Syria, which both the United States and Russia are calling for. The U.S. refusal to engage in a dialogue with political Islam could clear the way for progress to be made. Still, there is a big “but” standing in the way of all parties coming to a consensus on the matter, and that is Washington’s demand that Assad leave office. In a recent interview with The National Interest magazine, the former national security advisor to President Jimmy Carter, Zbigniew Brzezinksi, asked a seemingly rhetorical question: “Why did we all of a sudden decide that Syria had to be destabilized and its government overthrown? Had it ever been explained to the American people?” That is the real question: Why?